Happy Thanksgiving! We have finally finished cleaning up and have had our first day of leftovers. Our daughter is taking the remnants of our meal to a Friendsgiving today so all we will have left is some turkey that I plan on making into a turkey and wild rice casserole in the next few days. 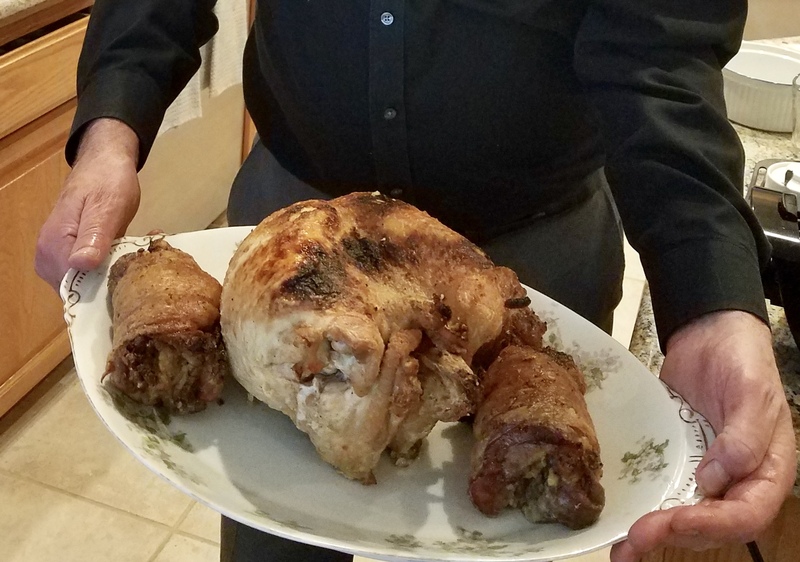 John went piecemeal with the turkey this year buying a whole bone-in turkey breast and four thighs. He de-boned the thighs and stuffed them with cornbread stuffing. The thighs were then rolled, tied, and roasted. It came out great! 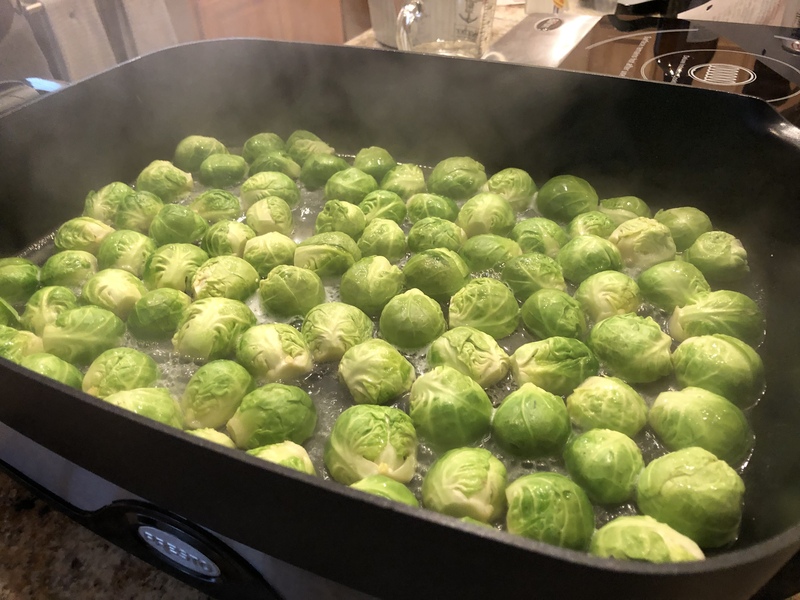 Next here are my Brussels sprouts cooking down in a little sugar, salt, butter, water, and dry sherry. Once the liquid is gone they will brown. The 120 B. Sprout halves took two big pans to lay out flat. This was cooked at the last minute. 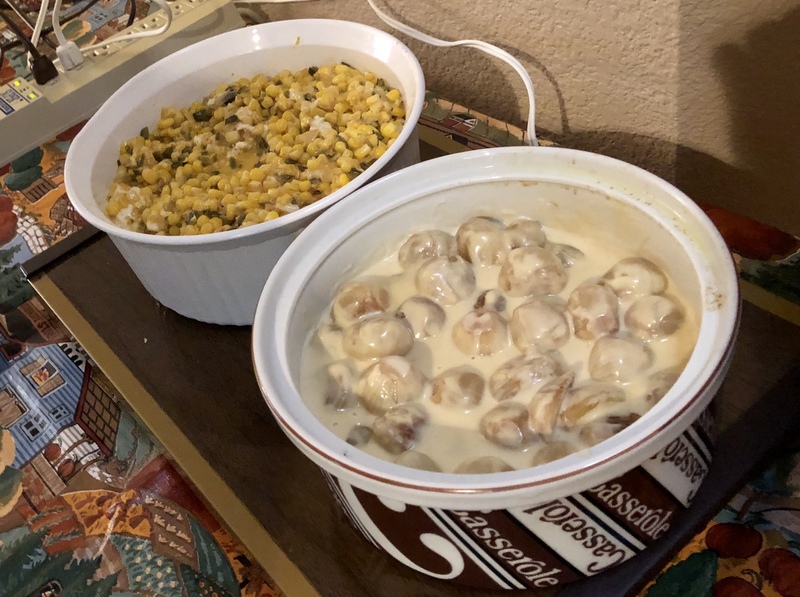 Our daughter made oven-roasted creamed onions and our son made a Mexican style corn dish. No frozen onions here! She peeled all 60 onions herself. Frozen onions lack texture. 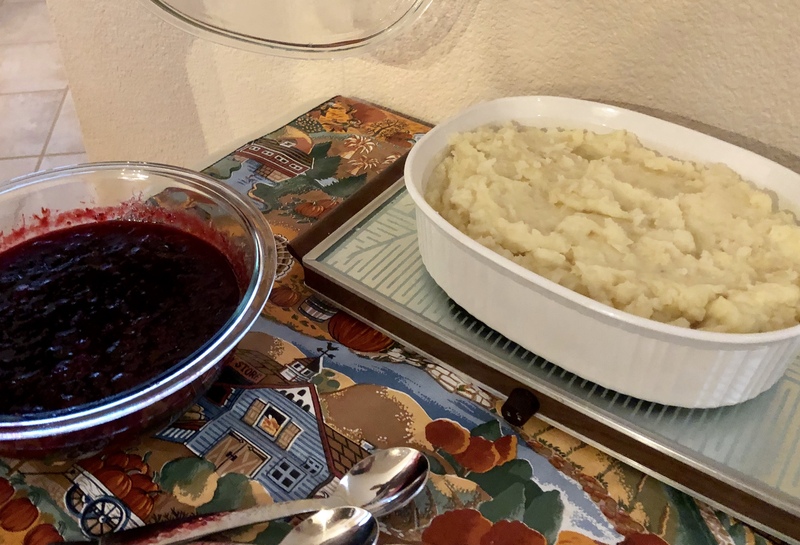 Here are some mashed potatoes and cranberry sauce. Our grandkids made the cranberry sauce and crescent rolls. Those are the only two things they eat at Thanksgiving. John also made a great turkey gravy to have with the meat, potatoes, and stuffing. 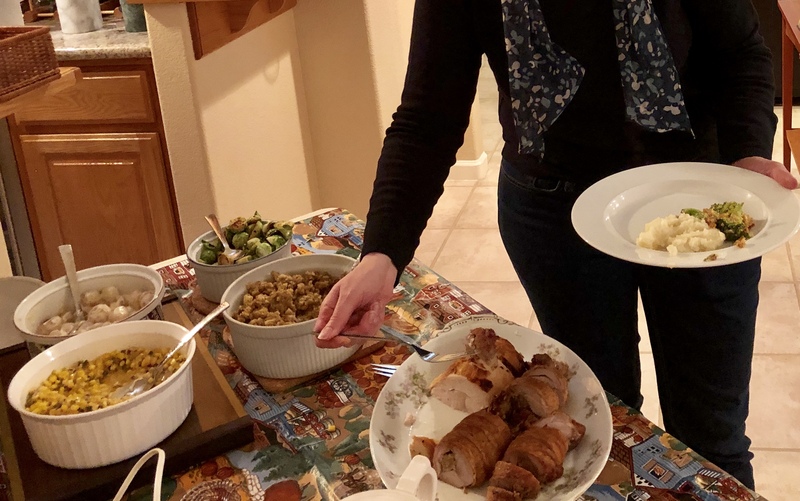 In addition we also had hors d’ouevres, a broccoli dish, stimparata (Italian marinated olives), additional stuffing, gravy, red and white wine, three kinds of pie, and ice cream. We serve our dinner buffet style so the food stays hot and there is no passing around. And with this rendition of Thanksgiving I am passing my apron strings on to the next generation and will be a guest next year instead of the host. We shall see what happens! This entry was posted in American, Desserts, Kitchen tips, Poultry, Vegetables and tagged Thanksgiving. Bookmark the permalink.